CORRECTION: This story was updated at 11:59 p.m. on Tuesday, Sept. 25, 2018, to state that Blackburn charged that Schumer "personally recruited" Bredesen to run in the contest. 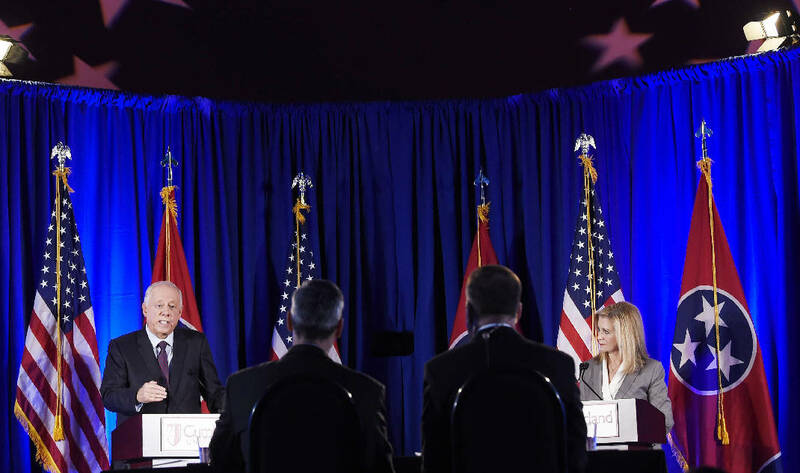 LEBANON, Tenn. — Republican Marsha Blackburn and Democrat Phil Bredesen clashed repeatedly here Tuesday night during their first televised U.S. Senate debate in a pivotal Tennessee contest rated as a toss up. Areas where the Brentwood Congress member Blackburn and Bredesen, a former governor, disagreed included the focus of President Donald Trump's tax cuts, how the nomination of Brett Kavanaugh to the U.S. Supreme Court should be handled, addressing the U.S. deficit and the opioid epidemic. Among their few points of agreement: unhappiness over Trump's handling of tariffs, although Blackburn voiced hope the president's strategy would ultimately work. From her opening statement until the end of the one-hour debate held here at Cumberland University, Blackburn aggressively went after Bredesen on issues. And she repeatedly attacked his assertions that he would bring to Washington the same pragmatic independent-thinking style that he used as governor from 2003 to 2011. She charged that Senate Minority Leader Chuck Schumer, D-N.Y., "personally recruited" Bredesen to run in the contest to succeed retiring Republican Sen. Bob Corker of Chattanooga, and that Schumer has "bought and paid for his campaign." Bredesen retorted that's "crazy" to think he would be beholden to his party's leaders, saying he's no "political lackey." "We need to get new leadership," he said. "I will tell you right now, that if I'm elected, and when I'm elected and go to Washington, I am not going to be voting for Chuck Schumer." He later launched his own attack on Blackburn, saying in his closing remarks that Tennesseans "certainly are going to have a choice" in the Nov. 6 election. "If what people in Tennessee want is more of that sort of hard-nose politics then I'm not your guy. He also described Blackburn as a "person who has spent the last 16 years in Washington, and quite frankly it shows," he said. When asked by moderators about Trump's Supreme Court nominee Brett Kavanaugh who is facing charges by two women that he sexually assaulted them either in high school or college, Bredesen said he supports Christine Blasey Ford testifying before the Senate Judiciary Committee. But, he said, the politicization by both Democrats and Republicans of the issue "disgusts me" and has transformed an "important part of the Senate's function and turned it into a circus." He said Blackburn "announced she was voting for Kavanaugh within minutes of him getting appointed." Blackburn agreed Ford should be heard — Republican senators plan to let her — but noted that "if I were in the Senate I would vote yes to move Kavanaugh forward and extend that to the floor. He is an eminently qualified jurist." "If I were in the Senate, I would vote 'Yes' to move the nomination forward," Blackburn added. "What we see taking place is a PR stunt by the Democrats. It's a character assassination. It's dirty politics at its worst." Blackburn criticized Bredesen for his own handling of sexual harassment issues while he was governor, saying reported instances dramatically increased under his administration and some documents were shredded. Bredesen defended his administration's policies, saying the increase was the result of new reporting standards and the documents were put off limits to the public in order to protect complainants. Asked by moderators about problems with opioids, Bredesen hit Blackburn for co-sponsoring a 2016 law that an investigation by 60 Minutes and The Washington Post said limited the U.S. Drug Enforcement Administration's abilities to control pharmaceutical companies. "When she went to Congress 16 years ago she started to get very friendly with big pharmaceutical companies and they asked her and she passed this health bill that basically took much of the enforcement ability the DEA had to deal with these issues away," he said. Blackburn said "what he just said is false," arguing the bill passed both House and Senate "unanimously" and was "bipartisan." Bredesen also hit Blackburn for her work in Congress, including for receiving taxpayer-funded health care while working to weaken the Affordable Care Act. The candidates also quarreled over the 2017 tax cuts passed by the Republican-controlled Congress. Blackburn began by recalling how Bredesen called Trump's tax cut "crumbs." But she argued they have led to led to great investment, job growth and the lowest unemployment in decades. "Phil Bredesen has said he would have voted against the tax cuts," Blackburn said. "Chuck Schumer has bought and paid for his campaign," a phrase she used over a dozen times. Bredesen called the way the legislation was handled "a perfect example of the dysfunction" in Washington. Tax reform is a "great idea," he said, but added "the reform got put aside" and Republicans went after the "easy part, the fun part" with corporations and higher income individuals benefitting most. Noting that it also adds "substantially to the national debt," Bredesen touted his own idea to address the national debt, a six-year freeze on all spending increases except for Social Security." It's something that's easy to do if Congress has the courage," he said, jabbing at Blackburn. Both, however, stressed they were unhappy with Trump's handling of tariffs, although Blackburn said she hoped Trump's gambit pays off and believes it already has with Mexico and the European Union. The debate comes as both candidates as well Republican and Democratic independent expenditure groups spend millions of dollars to sway voters. Both candidates are vying to succeed Republican Sen. Bob Corker of Chattanooga, who isn't seeking a third term. The contest is seen as fiercely competitive in a red state where only one Democrat, Bredesen, has won a statewide election since 1990. Bredesen has a narrow lead in two recent national polls and the respected Cook Political Report rates the contest as a toss up and the Real Clear Politics website's summary of major polls since spring shows support evenly split. Tuesday's debate was sponsored by the USA Today Network-Tennessee, NewsChannel 5 WTVF-TV, Nashville Public Television, the League of Women Voters of Tennessee and Cumberland University. The candidates have one other debate, Oct. 10, in Knoxville. Contact Andy Sher at 615-255-0550 or asher@timesfreepress.com.